Okay, you’re convinced. You want a lovely, low maintenance garden overflowing with native plants. But, standing between you and the sweet sound of hummingbirds buzzing your California fuchsia is a large patch of water-sucking green. It’s time to kill your lawn. Consider sheet mulching. Also known as sheet composting, this non-toxic soil building method can be used to kill fescue, rye, bluegrass, and even the dreaded Bermuda grass*. Sheet composting kills weeds by starving them of light. It takes at least 6-8 months to work. Dead plant material will break down into compost to enrich the soil. New weeds are reduced because it is difficult for them to anchor their roots in deep mulch. The sheeting and the mulch will break down over time, forming compost. 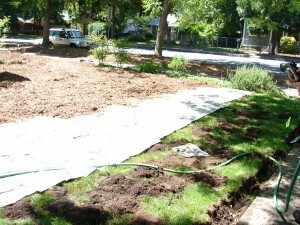 Sheet mulching should be placed before new plants are installed if being used to kill lawn or weeds. It can be placed after plants are installed if other weed removal techniques such as solarizing have been completed first. Here’s how to do it. Newspaper and wood chip mulch are layered over the lawn. Newspaper or plain cardboard. Don’t use glossy colored pages as they may contain metal pigments. Compost in a 1-2” layer for gardens that will include edible plants or traditional landscape plants. Compost is not necessary for native plant gardens. Quantity calculation for mulch is: (Area in square feet) x .08 to .15 ÷ 27 = cubic yards of compost required. Wood chip mulch in a 4”-6” layer. ‘Walk-on’ bark, available from landscape material suppliers, has longish strips of wood and barks that knit together to help it stay in place. You can also get shredded wood/bark from tree companies for much less cost; verify with the supplier that it is disease free. Quantity calculation for mulch is: (Area in square feet x .33 to .5) ÷ 27 = cubic yards of mulch required. If the soil is compacted and/or dry, water thoroughly. To prevent runoff, you may have to apply water for a short period, wait for it to soak in, then repeat as needed. 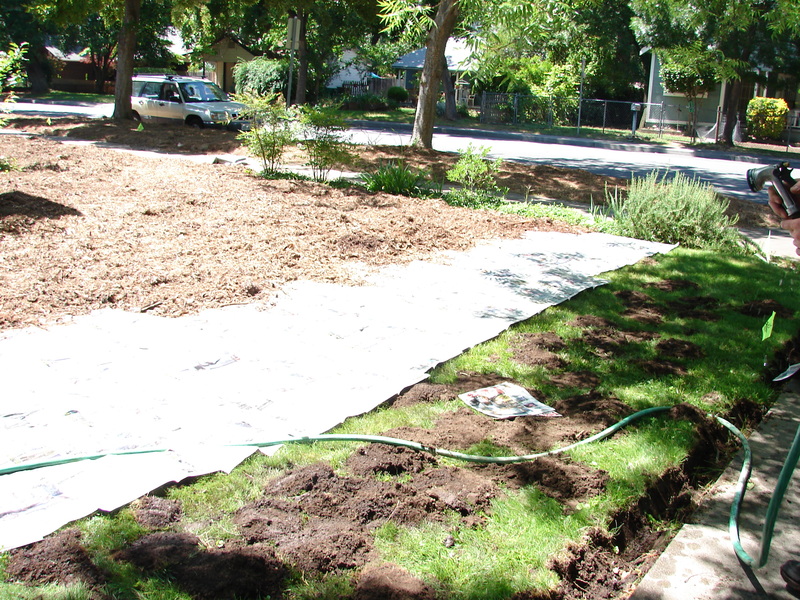 Dig a beveled trench where lawn abuts paving to help keep mulch in place. 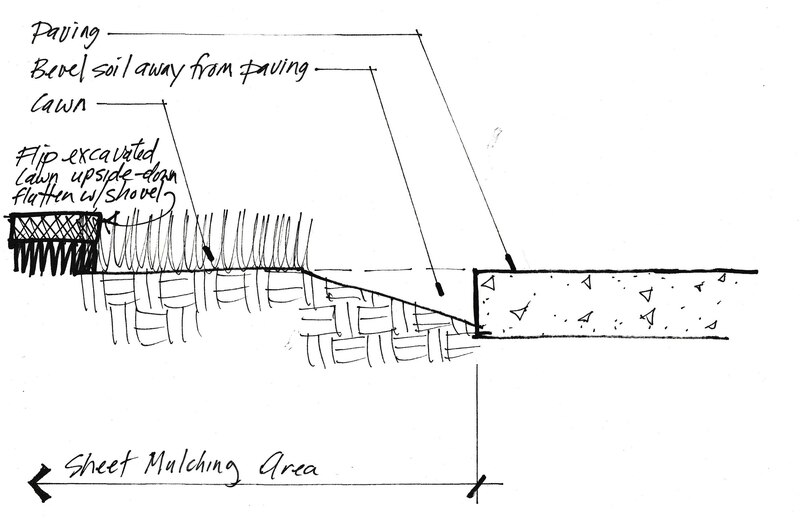 To reduce spillage of mulch onto adjacent paving, dig a narrow, shallow trench at the perimeter the area to be sheet. For edible or traditional landscape gardens, place 1-2” depth of compost or worm castings over entire area. 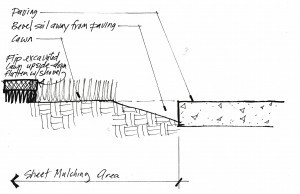 Omit this step for native plant gardens. As you are laying the paper, place wood mulch over the top of the paper to a 4”-6” depth. Place the mulch as you lay the paper so you don’t have to walk on/tear the wet paper. If you are placing the mulch when the plants are already in the ground, keep the mulch a foot from the plant stem. To plant after the sheet mulching is installed, push back the mulch and cut away newspaper in a circle wide enough to dig your hole. Dig the planting hole 2x the width and 1x the depth of the plant root ball. Loosen coiled roots and place the plant in the soil so that the top of the root ball is slightly above the adjacent soil. Back fill with soil from hole, forming a slight rim at the edge of the planting hole. Replace mulch but keep it from contacting the plant stems. *Nothing will completely kill Bermuda grass in one go. Not Round up, not digging it out with a backhoe. With sheet mulching, expect excellent results and plan on keeping an eye out for the occasional persistent runner. I meant I want to prepare the soil this summer. ..
Good luck with your soil preparations, Anika!